We received a lovely and thoughtful anniversary gift from Younger Daughter: a Groupon for a wine, chocolate, and strawberry festival. Sounded like lots of fun, and something to look forward to after vacation. The location was two hours away in New York, and we debated getting a hotel room and turning it into a mini vacation. Everything local was booked, however, so we decided to just make a day of it. We envisioned wandering the grounds of the winery, sampling certain wines paired to go with different kinds of chocolate and strawberries galore, perhaps some music, some Adirondack chairs (even though we were in the Catskills – do they make Catskill chairs? Do they kill cats to get them? Oi, sorry cat lovers!) and maybe buying a meal to soak up the alcohol and make us safer drivers. Doesn’t that sound like a lovely picture? Well. It was a lovely day, but much different than I thought. It wasn’t exactly a vineyard, it was more like a house that had a barn in the back that had an area for entertaining. We were directed to “the kitchen” which was right behind the welcome counter (which coincidentally was also the check-out counter) to be given our plates. This was a small paper plate that had a mini brownie bite, a small square of cheesecake, a half slice of poundcake with strawberries on it, and a chocolate-dipped strawberry. We were then directed to “the bar” which was right next to “the kitchen” and was the site of the tasting. It was interesting to taste the different wines, and most of them were fruit-based. There was raspberry, strawberry, black raspberry, and apple, none of which I liked because I really don’t like sweet wine. To me, it’s like drinking a glass of jelly you’ve put through a strainer. The merlot and chardonnay were okay, not great. We bought two bottles of a white that was a little sweet (for Hubby and Older Daughter) and a port which I’d never tried and decided I immediately liked once I felt the warmth of the brandy it was mixed with flooding through me. We left, smiling at the hosts, then got in the car. We looked around. And around. And around some more. We ate at an Italian-American-Mexican place and took the pizza. They had penne pizza. Of course I ordered it. It’s pizza with penne on top! Behind the place there was a farmer’s market, so after we finished wrestling the yellowjackets for our lunch, we investigated. There were three vegetable stands, four stands selling honey and honey-related products, two baked-good stands, and one Italian cheese stand. We bought corn, peaches, and the season’s first apples, and tried really hard not to listen to the folk singing trio who made me feel sad that they had obviously lost their way to 1973. They looked to be about 65, two men and a woman but an extremely far cry from Peter Paul and Mary. (I’m fairly certain Peter Paul and Mary took regular showers.) The long grey hair, the macrame vest and long skirt, sandals, and the guitar cases covered with old and cracked stickers made me want to peer around the corner for the sure-to-be-there VW mini bus. I’m sorry if that makes me sound snarky, because I don’t mean to be. I tend to project when I do my people watching and imagine what people are thinking and doing and feeling and this blog is like being in my imagination, so I’m really sorry. For you. In my imagination. But now I’m home, I’ve had a cup of tea, and I’m trying to stay off the internet so I won’t see anything about Dr. Who since we’re all going to watch it tomorrow as a family instead of tonight while Older Daughter is working. 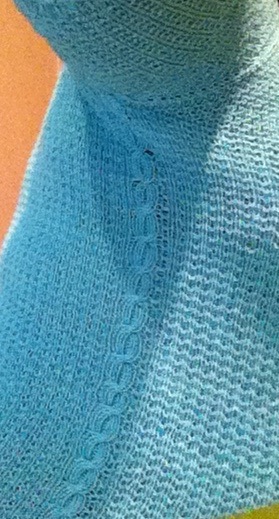 Looks like I need to knit. 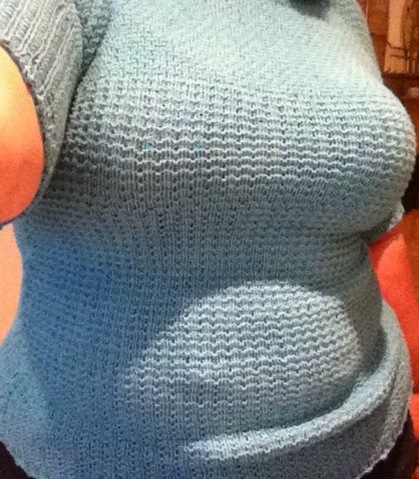 Here is the t-shirt I knit in bamboo. I love it! It kept me very cool during the ridiculous heat of Florida, and I love the color (which is the truest in the cable picture). I hate doing selfies because it looks like I’m thrusting my chesticle area in your face and I’m not that kind of girl unless you buy me a drink first. 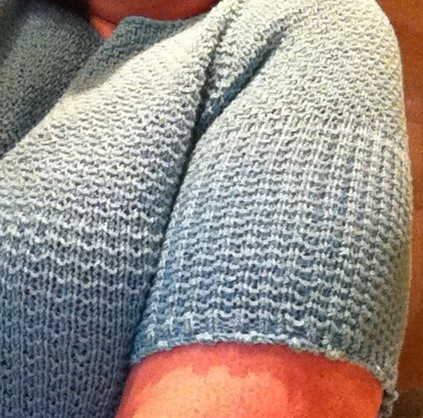 Sleeve detail for those of you who care about such things, and among my friends, that’s quite a few of you. I won’t even go into the ridiculous pose I had to strike to capture the cable detailing going down the side…but there’s nothing too awkward for my readers. Wait, I didn’t mean that. Till we meet again, poppets.